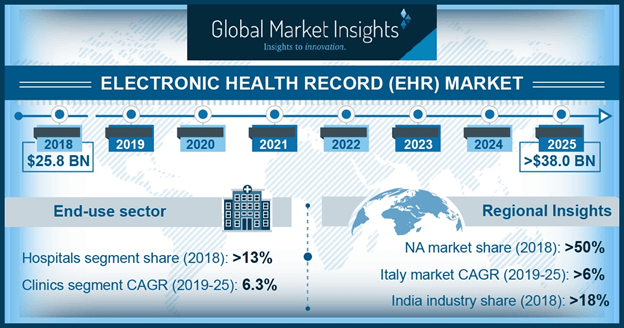 EHR Market size is set to exceed USD 38.0 billion by 2025; according to a new research report by Global Market Insights. Rising adoption of electronic health record will augment electronic health records industry growth in the upcoming period. Numerous emerging countries are recognizing the importance and benefits of electronic health records and increasingly investing in such technology. EHR offers enhanced patient care and management along with significant cost savings. EHR assists the practitioner in management of patient data and streamlines workflow that should positively impact EHR market size. Increasing incentives and grants for implementation of healthcare IT solutions across healthcare facilities will offer attractive segmental growth potential. Enactment of Meaningful Use (MU) incentives to achieve better adult and pediatric care is forecasted to expand adoption of EHR. As investment in electronic health record is expensive, availability of funding and grants will highly impact global EHR market growth. However, lack of skilled professionals to handle sophisticated technology in some emerging sand underdeveloped countries can hinder EHR market growth over the coming years. Web/cloud based electronic health record software product market was valued at USD 12.5 billion in 2018. Web-based EHR provides improved speed and flexibility to the end-users in terms of its operability. Access to many users simultaneously and wide network access further adds to the advantages of cloud-based EHR software. Moreover, web/cloud-based EHR software considerably saves cost that should escalate its adoption over the forthcoming years. Patient management segment of EHR market is estimated to progress at 6% CAGR during the forecast timeframe. EHR offers systematic and timely scheduling of patient data. It enables safe and reliable documentation with time-effectiveness. In addition, flexibility of management of vast data points regarding the patient will offer momentous growth opportunity for patient management EHR application market. Clinics EHR end-use market accounted for over 17.5% revenue share in 2018. EHR provides seamless access and interface for clinic facilities at any location. Presence of clinic management software further enhances patient and practice management, that will drive its adoption rate clinics over the forthcoming years. furthermore, expanding healthcare infrastructure across emerging nations will increase clinics EHR end-use segmental size in the upcoming years. U.S. EHR market will foresee robust growth at over 5.0% CAGR in the forecast timeframe. Growing adoption of EHR in the U.S. across all physicians and healthcare providers will pose to be high U.S. EHR market growth rendering factor. High internet penetration and availability of investment will accelerate EHR adoption rate. Furthermore, increasing spending on healthcare IT will boost U.S. electronic health records market size in the coming period. UK EHR market is forecast to witness over 4.5% CAGR throughout the projected timeframe. Wide accessibility of EHR in UK will increase the demand for EHR in the country. Numerous providers of EHR in the UK are focusing on development and advancement of EHR. Moreover, high awareness regarding benefits of electronic health record will expand UK market growth. Few notable players operating in global electronic health records market are Allcripts, Cerner, eClinicalWorks and Epic among the other industry players. These players are focusing on introducing and expanding novel technologies to fortify their offerings.